I have lost count of the times I have started writing this entry, in the past few weeks, my broken paragraphs have stumbled between sadness, joy, relief and loss all at once, and I know I have worried far too much over the sound of my own voice. 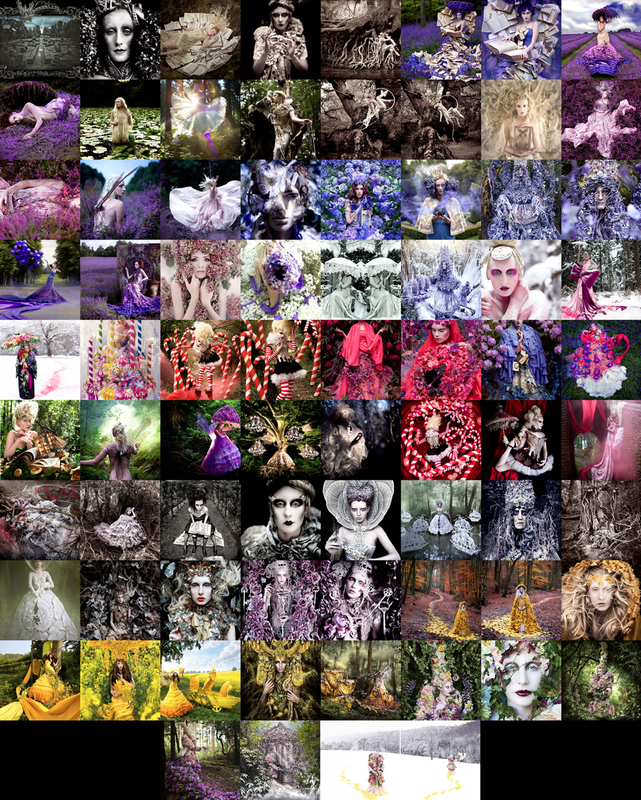 Today is October 19th 2014, 5 years and 3 months to the day since I first stood in that lavender field clutching my brand new camera, out of my depth and terrified, preparing to shoot the first picture of the Wonderland series. There are times when I wish I could go back and put my arms around my younger self, to soften some of the anxiety I had felt and whisper words of encouragement when there were none left inside of me. To watch the ghosts of Elbie and I working together for the first time, oblivious to how our friendship would blossom and laugh at the sheer shock and excitement on my face when the wind filled the skirts of our ‘Lavender princess’ and I managed to capture that first big shot. Back then I was 33 and completely unaware of where the next few years of my life would take me, the people I would meet, the highs and lows of a changing path that would push me in ways I could have never imagined possible, or would have experienced if my mother hadn’t left us that bleak November Sunday. For 7 months I had fallen apart, my body had raged against me to the point I shook on my way to work and I cried in public everywhere I went. It is true to say I had never felt so utterly out of control, hopeless and lost. Nothing can prepare you for grief; it hits you like a runaway train that you are left clinging to with bleeding fingernails, having no idea how long its journey will be, or where it will end. All you can do is hold on and try your best not to give up or let go. It will take you through dark places, valleys where you can’t remember who you were and nights that seem to never end… and on the better days, the sun will come out, and you can breathe a little, watch the world pass you by and remember that there is still beauty out there…..somewhere. This may all sound a little dramatic, but it is what happened to me, and without beginning this series I shudder to think at how much worse it all could have been. Wonderland became my sanctuary, my alternate existence, where I could block out what had happened and run away to a place where it didn’t matter what I looked like, or who I was. I could lose myself behind the camera and disappear deep into the arms of the woodlands that slowly began to heal me in the most unexpected of ways. Like a kite cut from its string I had lost my family home, the last shred of childhood we all hold on to as adults and yearn to return to when life gets too hard. So I drifted and as the project began to grow I noticed the subconscious parallels between my own journey and Katie’s seeping through the pixels and really that was how the narrative was born. Now, years later as these last summer months have approached and passed in the wake of the final pictures, I had felt excited and prepared for the end. I expected some sadness, but on the day I opened the last two files to begin editing, I fell apart in a way I never could have predicted and that is the simple truth of why this has taken so long. I sat in the silence of the studio, staring at my monitor with tears rolling down my cheek, as all I could see was myself in Katie’s shoes walking through that blank snow scape, towards a home I could never reach again in my own world. 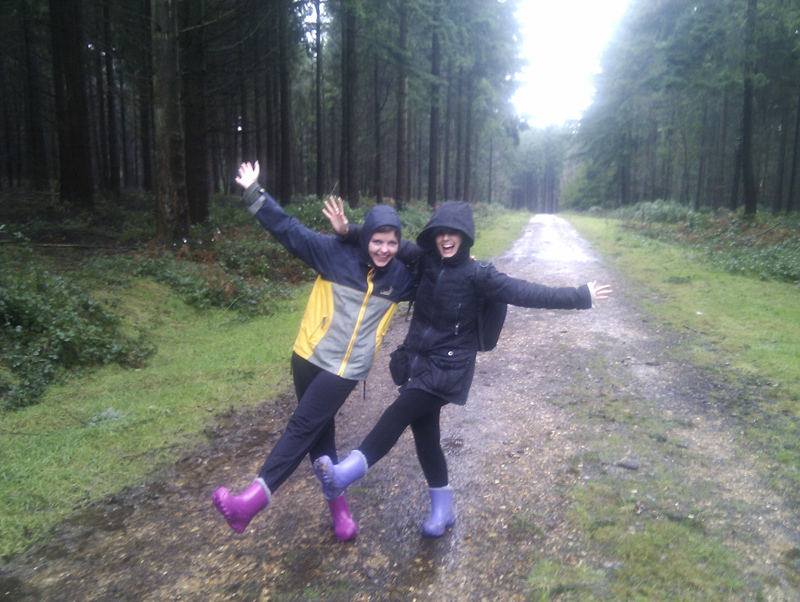 It was indescribable and after days of trying to make some kind of progress, I switched off the computer and went to the hills and the woods and I walked and walked until I could make some sense of it all. For 5 years I had woken up with a never ending ‘to do’ list of editing, shoots and writing for the project, giving me a constant purpose, distraction and yet at the same time an unbreakable fine thread back to my mother. In all this time my life had been echoed through Katie and so an ending for her would also be an ending for me and I needed to believe it felt right and real for the both of us. 20 months earlier, back in the winter of 2012 I had struggled a great deal with how the closing scene would look and what its message would be. The storyteller in me was full of grand ideas and ‘happily ever after’s’ but to suddenly tear my real life link from Katie in that final moment felt wrong. I can only describe the past few years as swimming towards the surface of the water from the depths of an experience you can’t quite explain. Three years into the project I had turned a corner at the point of ‘The Distant Pull of Remembrance’ and decided it was time to begin the journey back to reality, from beneath the fantasy I had buried myself under. Ultimately I always knew this meant Katie would eventually return home, but she would also be changed from her experiences and somehow I wanted her apprehension and emotion at that last moment to be kept private, her back turned. For myself left on the other side of the screen, home could only ever be a metaphor for finally finding some peace within myself and breaking through that surface; something I felt had to be my true state of mind before I released this final image. Consequently, the weeks stretched on as I spent my days in the landscapes of my adult home, trying to find that point in my heart. During this time I made some big decisions and cried a hell of a lot, but now as the first leaves of autumn are finally here, I can safely say it is time, and at long last I’m ok with letting go……. As I write these words it is hard to believe I shot the closing scene for Wonderland a whole year and 9 months ago in January 2013. I remember on the day feeling so excited and almost shocked that I had finally ‘done it’ and taken the last picture of the series that it just didn’t feel real at all. Of course I was well aware I still had an entire summer of more images to create ahead of me, but this meant the story was now locked and there was indeed an end to it all. The reason the scene was shot out of sequence was in order to get the snow. The final moments of Katie passing through the magic door in the woods meant that it would have to be winter on the other side, and so the last 8 pictures of the story were shot in reverse to meet the correct conditions. 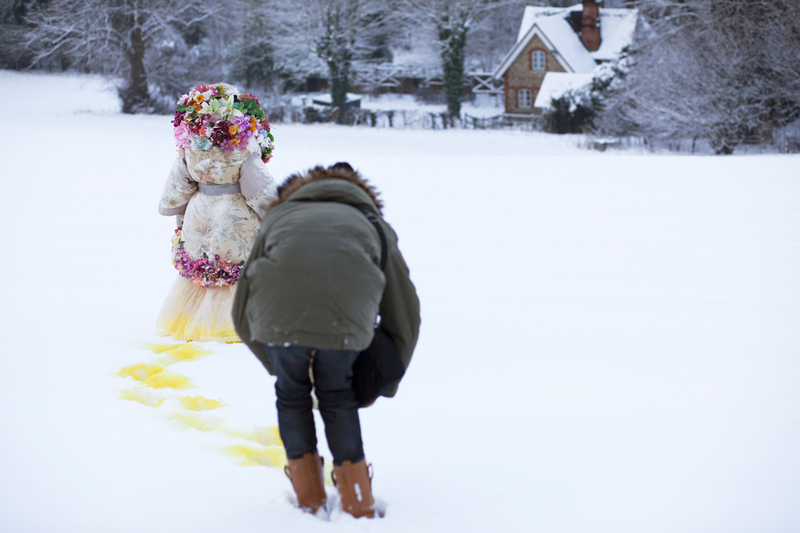 The biggest panic was lack of time, in the UK snow can come and go within a handful of days, this time it arrived early and unannounced, before I had even finished making the floral coat. So after barely any sleep, and a lot of glue gun burns, I had no choice but to frantically pack the unfinished costume in the car and head out into the white world that had fallen during the night. When it comes to location scouting I often hunt for weeks to find the perfect spot, but in this case it was impossible to predict what a place would look like until it had snowed. So without a plan I pressed my face to the glass of the car window, as we silently crawled along the country lanes, scanning the horizon for the perfect house that would soon become Katie’s home. After an hour of circling villages and farms, the hills fell away to reveal a vast blanket of untouched snow, edged with a distant frame of frozen trees rising up into the grey February sky. There were no signs of life apart from a single house nestled at the foot of the fields and that was when my gut twisted and my heart leapt. It was exactly how I had imagined in my dreams, we stopped the car, I bit my lip, this was where it would all end…..
By the time we had parked and carried everything to the field it was snowing really hard. Elbie and I dressed Katie in the coat and much to our amusement had to wrap her with garment bags and the reflector cover to protect her costume and hair from being ruined. 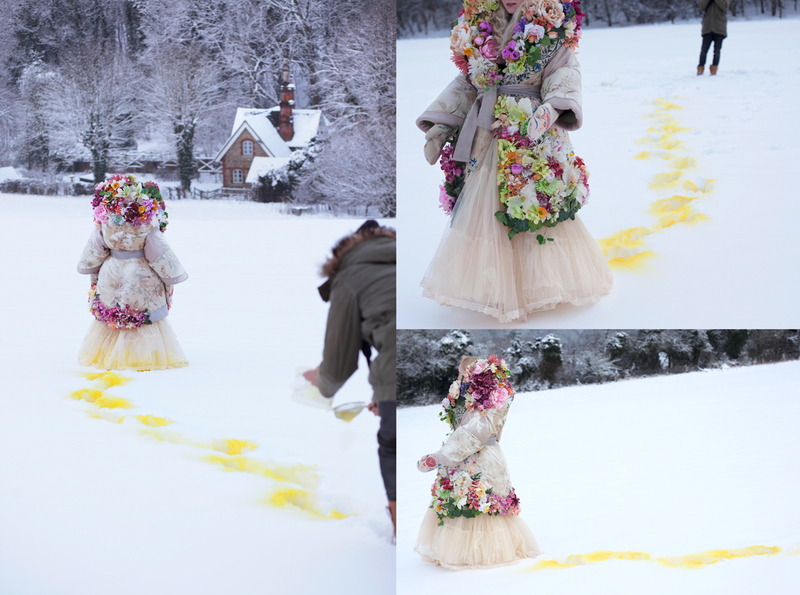 Once Katie was in position, Elbie set to work on creating the yellow trail, carefully striding into the distance filling each of her footsteps with the coloured powder as she went. It was such a surreal sight, the low visibility had reduced the landscape to nothing more than a faded suggestion and all that was left was Katie cloaked in shivering flowers, with the dissolving sweep of yellow left at her feet. It was already after midday and the winter sun was low and faint as the wind blew snow into our eyes, mouths and constantly at the lens of the camera. Finally Katie’s protective layers of plastic were removed and instead held over my head to create some shelter, where upon suddenly from nowhere, a visitor arrived … our robin. If you are a regular reader of my diary and have been following the series, you may know that in the past we have had some strange things happen on the shoots, it can come in the form of light, or sudden dramatic shifts in the weather. These moments often cause us to second glance each at other and for me to utter my mother’s name under my breath. This day was no exception and as we stood together the original four friends who began the series all those years ago, we just had to laugh and gasp at what happened next. The robin appeared in the middle of the empty field and flew straight up to Katie’s feet, we all noticed and pointed as it hopped around and luckily my husband Matt quickly pulled out his phone and started filming. After a quick circle of our group it disappeared, but then returned immediately and that was when a shiver ran down my spine. 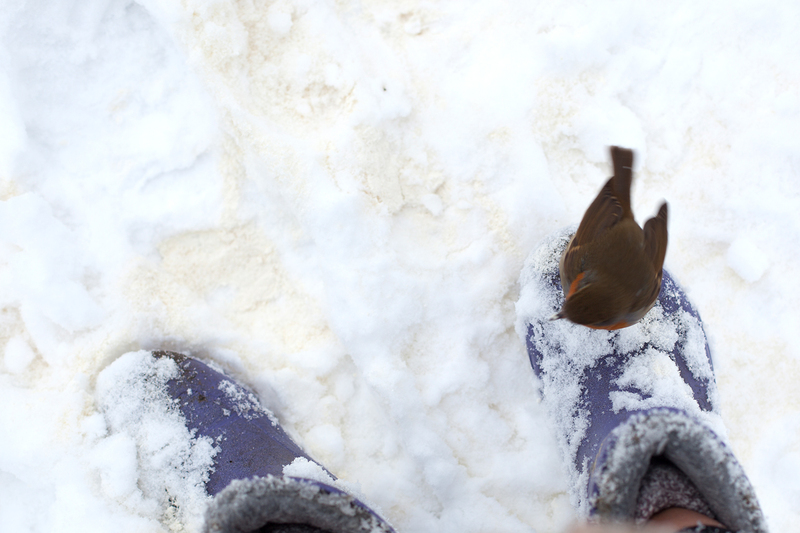 Our robin was completely unafraid and after sitting on my boots it decided to perch beside me like an old friend whilst I took the first shots. Next it flew on to Katie and simply stayed, I watched with my jaw open as this little bird fluttered along her arms, shoulders, her head and hands! I have never seen a wild bird behave in such a way, especially not a robin. There were points when it almost mirrored Katie’s pose, bowing its head, or moving in closely to her face as if there was an unsaid dialogue between them. It even paused to shelter from the snow in the hollow of her sleeve, and all the while my heart heaved in my chest. I continued to take pictures until our new friend flew directly towards me landing on the reflector above my head, and then with a puff of his chest for the camera, he turned and disappeared into the gloom, leaving us stunned and laughing. Later that night I read that robins are regarded by some as spiritual messengers and the bringers of change. I cannot explain our little encounter, but transformed the entire emotion of the picture for me and I am so thrilled I have it on film to share with you all. As the weeks have passed I found myself agonising a great deal over which shot to choose for the finished picture, trying to decide which position of the robin would feel right for the relationship between Katie and her new companion. In the end I chose the fragility of it sheltering from the snow on her hand, held close to her body. I guess I love that it is not noticeable at first, it is less obvious and acts as a beautiful surprise, like a little hidden treasure waiting to be found. After our moment with the robin, my focus returned to the picture and we decided to add more yellow to Katie’s trail and skirts. By now it may be clear to some of you that this scene was a deliberate nod to ‘Spirited Away’ taken in the first year of the series, as well as a reconnection and continuation of Katie’s golden path from ‘The Journey Home’. I always intended this picture to be ‘quiet’ and personal, it could never compete with the grand scenes that came before the door, as this was Katie’s real world now, having left Wonderland far behind. 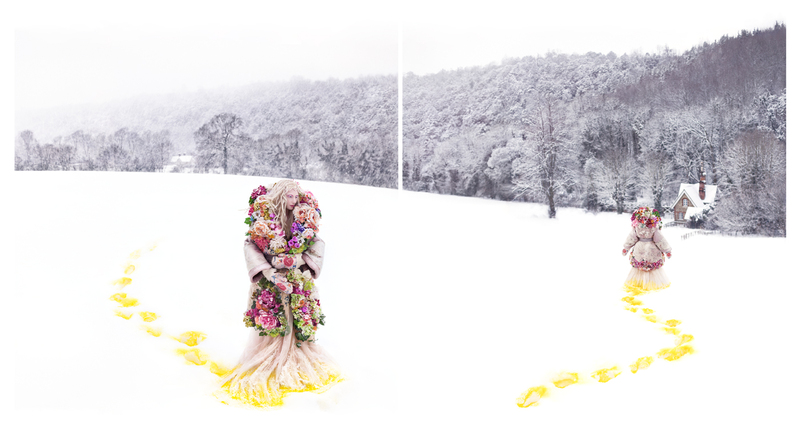 I chose a diptych because I have always imagined this moment like the final two pages of a storybook, as if we are watching her melt away from view into the white of the paper, no more than an illustration and a figment of our memories. It leaves me holding my breath, expecting the book to close and wondering if the door of the house will ever open and who will run out to hold her. So here I am, 5 years and 3 months later, my fingertips hovering over the keys of my laptop trying to find someway to say goodbye to a series that has changed my entire life. I am now 38 and it will be 6 years since mum passed away on November 9th. There are days when I almost have no idea how any of this happened, I fell into something I simply could not stop that became my obsession, my escape, my sanity and my madness all at once. I have never worked so hard in all my life and now I have reached the end I felt I had to do something to represent what this journey has been. I wanted to bring together the fantasy and the reality in one moment, as a memento for myself so I would never forget who I was at this point. So I began a self portrait that grew far beyond my original plan. For an entire week I scrambled through my attic, my studio and my home to pull together as many physical fragments of the ‘real’ Wonderland I could use, years of test prints, costumes and props and somehow set myself inside it all. 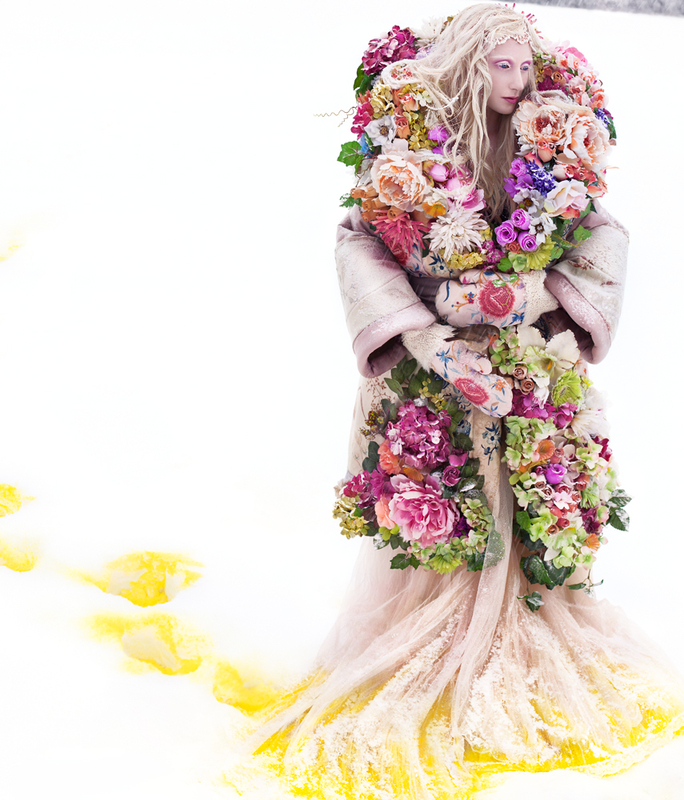 I climbed trees, stole ivy, nailed prints to walls and cut flowers all in the same way I approach my shoots. What started as a small idea escalated into chaos like everything I touch and now I sit back and laugh as I remember the insects crawling up my legs, the peeling prints off the damp brick wall and my own nervous stare back at the camera. It is a little landmark I guess, and something I wanted to share with you all. I am well aware the Limited Editions from the series are expensive for most people so I wanted to offer this print as an open edition for anyone who would like to own one, at a fraction of the cost. All the details can be found HERE . Now it is late and I just realised it’s dark outside. I have sat here for hours looking back through every picture, each one engrained with the most extraordinary memories and shining with the love I have for my friends. I ache with happiness. My dearest Elbie, Katie my extraordinary muse, the endless love and support of my husband Matt. 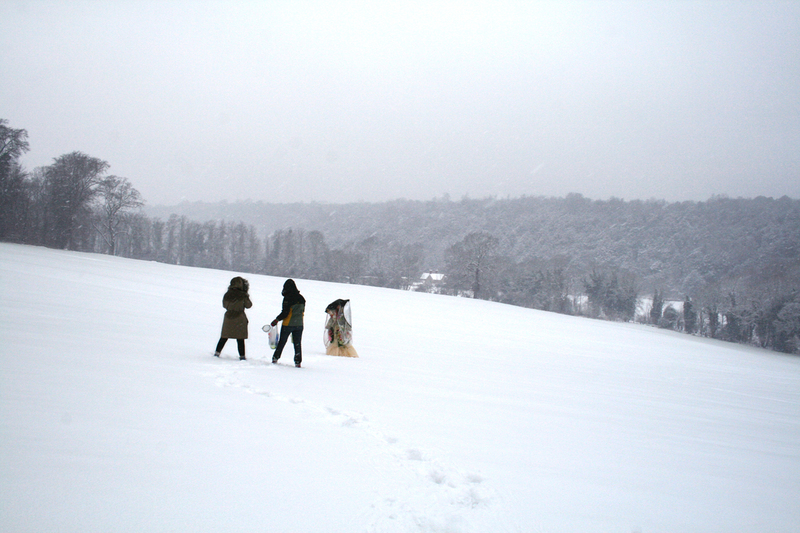 My wonderful models who have suffered hours of discomfort throughout all weathers, and Richard for capturing the last shoots on film in such a beautiful way. I am so indebted to you all. I now know that in losing my mother I gained a completely different perspective on life, It broke me, but it also rebuilt me with a greater empathy for so many things, something which I am relieved to have discovered earlier rather than later in life. I suppose it was her last gift to me and for that I must find a way to be grateful. I want to thank everyone who is reading this, who has supported the series and helped motivate and push me along when I have (often) felt overwhelmed, exhausted and like I couldn’t keep going. It is a strange thing I have bared so much in this diary, to tell the truth I still have no explanation for it, nor can I even really comprehend how far it has reached. But please know you have helped me immensely dear friends, even though we have never met. Finally to mum, you once wrote me a letter when you were starting your new life in France, and I missed you so much I was struggling with the distance between us. I have kept it close throughout all these years, and the words seem to resonate now more than ever before. I want you to know I’m doing so much better and that I can talk about you now without crying. That I can sleep again and above all I know you are with me. You were the rain the day we shot The Briar Rose, the unexplained light that made us gasp in the The Fade of Fallen Memories, and the dawn of our Wild Thing. You were the morning dew on my skin as I crouched in the flowers for Euphaeidae, the snow that fell on Elbie and I as we stood alone for Spirited Away and now and forever, you will always be my robin. What a beautiful end to your journey. As always I’m left in awe of your vision and the beauty of the reality you have created. 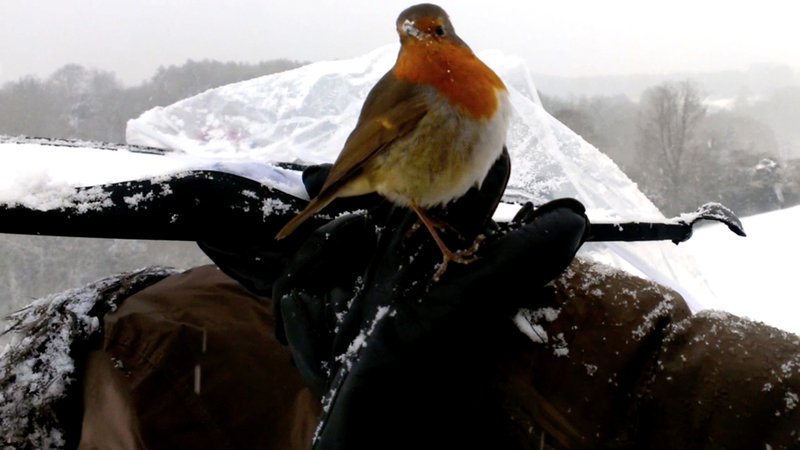 And the Robin… magic. All I can say is “Wow”. You are such a beautiful storyteller by your words and of course your photographic creations. Thank You so much for sharing your story with the world. It truly is a Wonderland! You have inspires me to not be a better photographer but also a better human being. I remember being in photography school years ago and we were asked to select an image that inspired us. Weeks previous i had stumbled across an image of yours in a lavender field. Without hesitation, this was the image i chose to share. You and the work you create are amazing and i have cherished every moment spent reading your blogs. And even though there will never be another wonderland, i look forward to what you create next. Peace and love, megan. Thank you Megan, I am overwhelmed., by everyone’s kind words and wish I could write back in equal measure. I’m so glad the series has touched you in this way . Congratulations on finishing your series. The work you have made is beautiful, and the diary entries have been wonderful. I felt like I was with you through your journey, and you have made me cry on numerous occasions. I have followed your story from the second photo you posted on your Wonderland series.. I’ve been left breathless, and in awe and cried with you and smiled at the beauty you have created. I can’t wait to see your story in print, and I love ♥ <3 your words, your photography, your art…it is inspiring. I hope the next journey is as awakening as this one was for you and all of us that followed your wake. You work is absolutely amazing. I have loved watching the Wonderland series, and have waited for each one with anticipation…am lost for words, except WOW!!! I picked up the camera for the same reason. Through it I started to see the beauty in life again. It gave me purpose, a constant challenge, and a place to hide, but also peak out from. The wonder of that gift is that, although you have now closed this chapter, you will continue to see and create beauty for the rest of your days. The perfect balm to grief. Thank you for documenting this journey. I look forward to seeing where you go next. The most important and truly rewarding aspect of life is the journey you make not the destination you reach. Your journey has been, and I am sure will continue to be, amazing. Any mother would be exceptionally proud of you. A father too! Yours is overwhelmed by his love and pride, in your work, in your resiliance and tenacity and in this journey you have undertaken. Thank you for sharing your thoughts. I found this very moving, especially as I know that one day I will loose my own precious mother, whom is currently a very fragile 92 year old..
Maybe the explanation for baring so much in your journal entries is that we were there to listen, to love your work and to encourage…a support network gathered from the world, helping you face and master truths that are too difficult to accept. As a mother I can tell you that the kind of love and connection you have with your mum goes beyond any explanation. It just IS. It is strong and gentle…and ALWAYS there. Your mother has been with you, has given you signs, has guided you through your own journey…and your life has benefitted. You have created beauty and meaning from the chaos and despair. You raised up a monument to love…and it was recognized by all who have felt love and those who value creative genius. And I am sure that nothing could have pleased your mother more than to see this process and outcome of your healing. Blessings and thanks to you for sharing such intimate words and photos. May the wings you have grown take you places you never dreamed of, even as this book has. If you ever have a child, I imagine his or her name will be Robin. It’s been a honor witnessing your journey. Thank you, Kirsty. i can’t remember the last time i cried, but i am in tears. it has been such a privilege to be able to watch you grow and learn and create even through the window of a monitor all these years. you’ve created such a loving tribute of gratitude to your mother that continuously leaves me at a loss for words. Thank you so much for opening up your life and your heart to us all, it’s affected everyone in ways impossible to convey. You are an inspiration. Der Alex I am so sorry to make your cry ! But I guess we all have, myself included endlessly whilst writing the post. Your words mean a great deal to me thank you for your kindness. My mother passed around this time last year Nov 2013. What an inspiration you and your photos are to me. to continue on and that she’s watching over me. Love the robin. xxxxx huge hugs, the robin was your Mum, how beautiful!! Oh Kirsty, this is a beautiful end ready for your next beginning. I had hoped to hold it together through the post but when your mum visited the shoot on the wings of the robin, I kind of lost it for a second. I was moved. Humanity is a peculiar thing, I am grateful your path crossed mine. Thank you for sharing your heart ache and your gift with the world. 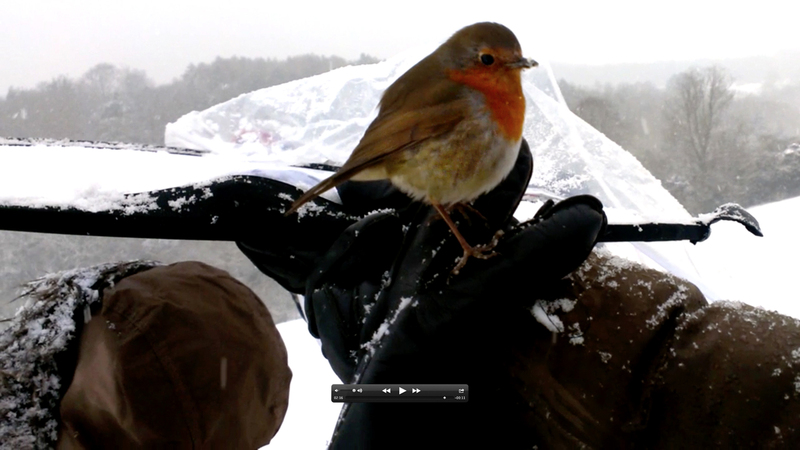 and the robin….so so special!! i do believe that God allows us such things so we know we are being watched and loved from above – that it was a treasure to remind you of your mother and her love and how proud she would be of you! incredible! i can’t wait for your book. i hope you include your journal entries – as personal as they are, they add such depth to an already amazing collection of art! This project that has come out of such a tumultuous time of grief and healing is truly a triumph of spirit. 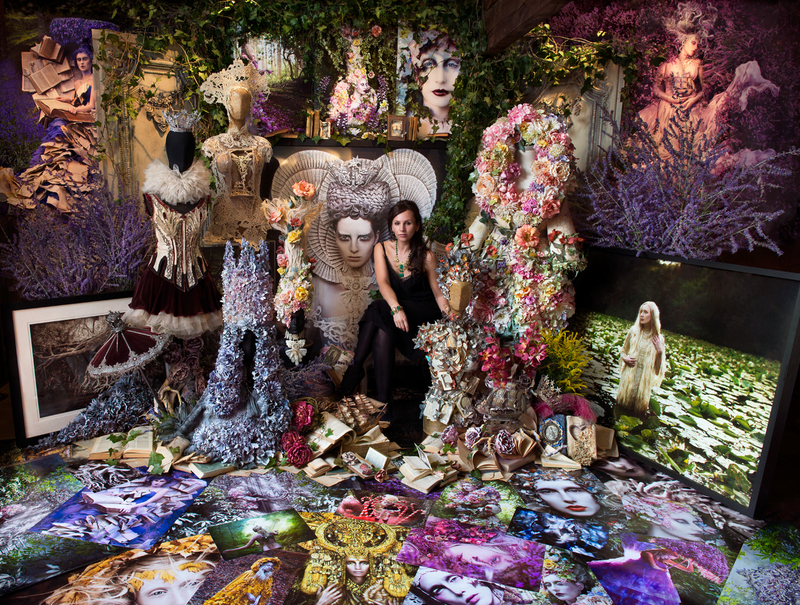 You have masterfully combined your incredible gifts in a way that makes every image of Wonderland an indelible impression to all that have seen them. Thank you for not only sharing all of this untouchable beauty with us, but also the deeply personal journey throughout its creation. The footprints really capture that Katie is returning home, but bringing her experiences from Wonderland as a part of her, leaving their mark on her real-world landscape; a perfect end to the story. I so look forward to having your book in hand. Congratulations Kirsty, this whole series has captured my heart. I look forward to a book of this series! I think that the hardest thing of being an adult is trying to turn a bad moment in your life in something good in the future. Only strong people can do this, and you did it. You’re an inspiration for a lot o people who has been in the same situation or almost the same, including I! I lost my grandpa 4 months ago, he was one of my favorite persons in this world and he wasn’t sick or anything, so you may imagine how shocking it was. I’m a student photographer and here where I live the things are really hard for who wants to be a fashion photographer but he always used to encourage me to continue on this road. One month after his dead, I was still too much depressed so I decided that I needed to do something about it. I had the idea of starting a photography project so in this way, I could express my feelings and feel a little less heavy inside. It’s really helping me to distract my mind! But obviously, always keeping the good memories of him in my heart. I feel so glad for you and all your history, I bet that your mother is really proud of you and will always be. Congratulations! One of the most amazing works I ever had the pleasure to see in my life. I lost my dad three years ago. I too found in photography a place to hide. In my journey I stumbled upon your extraordinary photos. But what spoke to me was your depth of grief over the loss of your mother, fresh as my own loss was. And you are quite right when you say it’s like being hit by a train–for me, one that I did not see coming, as his passing was sudden and unexpected. You are so gifted, and your complete story and images have touched my life in a weird sort of understanding about grief, loss, beauty and love. I look forward to seeing future projects. Congratulations, and best wishes. I don’t quite remember when I first saw this series, but I remember being dazzled. The lavender field picture you were talking about really blew me away and I couldn’t stop looking at all of the detail. I wasn’t aware that you had a blog, so this is the first blog post by you that I’ve read. I saw the robin and I wondered if it was real, because it looked real, but then I thought, “No way. How did she get a real robin to do that?” I continued reading and then I got to the part about the robin and I immediately thought, “Oh! It’s her mother!” I couldn’t stop crying after that. I’m not really sure what to make of this series except that it’s truly wonderful in so many different ways beyond just the picture. I’m so glad you did this. Thank you. Best wishes for your life and work!! Thank you dearest Kirsty for your years of hard work and inspiration and the strength to offer it, not just as a slick, money making piece of ‘art’ that the world would expect but as the wonderful, wondering, all encompassing work that it is. You have taken us with you…and those of us who have been around a while really do appreciate it…you have added something to our lives, not just in the artistic sense but in the emotional sense too. p.s. 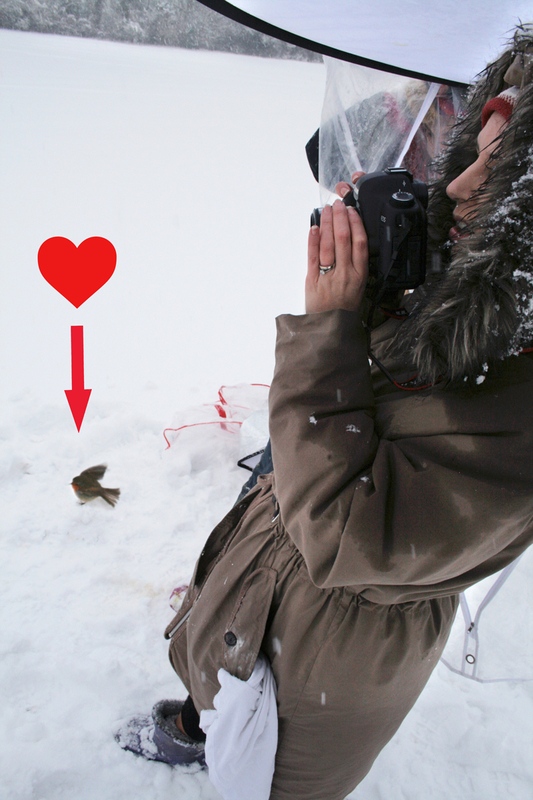 after she died, my mother has often, in times of my need, turned up as a robin and I have to admit I wept when I read about the last picture shoot. It’s taken me almost an hour and sixteen replays of Robyn Miller (aptly named) to absorb the finale in ‘Home’. I read through your prose slowly and steadily with a seeming rhythm to set the tone, knowing these words are pumped from the heart. In the four years that Wonderland has consumed you, it has coincidentally run parallel with a journey of my own in letting go, and for that reason I will always cherish this end. Through the greatest migration of my life, where I have learnt more about myself than I could ever know and whilst trusting my instincts to carry me, I wanted to thank you. Not just you and your imagination, but of course Katie, Elbie and your dear inspirational mum. I like to think that I’m not alone in the way that I see the world, the way that I study it and cope with real happenings. So when I feel more than just a story through art, I’m reminded that I’m never alone. I don’t believe in heaven, hell or purgatory, but now I do have my own Wonderland to bring me home. I feel so attached to this incredible and powerful journey of yours and the enchanting reality you have created for the rest of us to experience. It has been a gripping story I have eagerly followed and patiently waited for it to unravel itself over the past five years. Every new breathtaking image and every heart wrenching, tear evoking diary entry, more mesmerising than the last. I have been fully immersed into your dream world and have lingered on every compelling word you have written. I feel like a silent witness that has been watching from afar, almost since the very beginning, and now right through until the very end. I guess every beautiful story needs a captivating ending that still hints at a slight mystery of unanswered questions. I’m not sure I am quite ready to accept that this is the final chapter, to let go of a miraculous story that I have personally been so influenced and empowered by. At least I can revisit and immerse myself back into the engrossing magic and enchantment over again, to once again rediscover each alluring character, and realising the things I had either forgotten or not noticed before. Then there is the hope that one day I might be able to own the book. However, despite this being the closing scene of a colossal adventure I have been spellbound by, I look forward to what comes beyond wonderland. As you are fully aware, you have been one of the very few photographers in this world that have directly altered and influenced my own purpose in this life as a creative being. Your fascinating storytelling reignited a ravaging flame deep within myself that I had long forgotten about, something I had intentionally blocked out and became completely oblivious too. For many years, I wandered alone blindly in the great dark abyss, searching for a light that I did not imagine to exist. Helplessly inquisitive about my own identity as an artist, ambiguous of my own purpose, doubtful about my own precarious future. I was a mere robot ignorantly marching to the vague beat of obscurity of life, with no real horizon as a destination; no ambition, no ideas, dreams or aspirations. Always knowing that I wanted to do something more with my photography but never truly knowing what or even how. Then I discovered your ethereal creations, your very first Wonderland images and obsessively followed the unfolding fantasy, like a heroin addict. Your raw emotional biography unknowingly lifting my eyes from a deep sleep, and helping me to remember a past from long ago, a previous life I had purposely abandoned to avoid the barrage of confrontational and dispiriting memories I had locked away. My own start and personal journey through this life was the complete opposite to your own, but I connected with your meaningful story in a way that I had never done before with anything else I had ever encountered. The powerful love and deep connection between yourself and the tragic loss of your kind loving Mother, who would do absolutely anything for you, tore at my heart strings and allowed me to imagine something that I was never fortunate enough to experience for myself. A cheerful relationship and an admiring unbreakable bond that so many people in this world neglectfully take for granted, until it is obtrusively stolen away from them at the hands of time. Your authentic words and charming memories of the shared time you had with your affectionate and warmhearted Mother, and Father, gave me the opportunity to envision a life I had excessively craved as a child and young adult. The world you created for the rest of us to play in became the resolution of my own emptiness and solitude; the distant light that suddenly started glowing. Your irresistible words granted me a power to escape the desolation that had consumed me for an overextended time, and to forgive all the hatred and disregard that had been forced upon me long ago. Wonderland is so much more than just a collection of memories you have recreated for yourself, something to treasure and cherish and hold onto, it has helped so many others overcome their own personal challenges, struggles and conflicts too. Wonderland reminded me of my own origins as a photographer and permitted a real purpose in my life going forwards. Wonderland helped me understand the very reason I create and what I want to be remembered for. Like you, but very much unlike many other artists, I did not find my passion for taking pictures through the inspiration of others, through education, or from the realisation of a hobby. It came to me out of pure necessity. Photography found me at a very young age, at a time in my life when nothing but utter darkness surrounded me. It became my light and allowed to me imagine a substitute existence for myself that I could escape into. It was essential to my survival. Over time, I forgot that and my light eventually faded. I was always compelled to create, but I never truly knew why. Your Wonderland project helped me realise that my work exists so that I can recreate an eloquent interpretation of my own life, recreating it in a manner that satisfies my own sense of how I choose to decipher the world around me. That I can use photography to express myself artistically; to bring together all of the fragmented delusions, dreams, aspirations, thoughts, feelings and memories I have ever had, so that I can translate all of those wonderful experiences into stories, which other people can connect with, and become inspired by. If had have not discovered your work when I did, I would probably still be trapped in a constant state of perplexity and isolation. It was your influence, your words and your images that directly guided me to the path that would begin an enthralling journey of exploration and discovery; to create mysterious worlds we will never live in and to tell the tales of strangely compelling characters we will never meet. I am still a very long way from where I want to be, the road ahead of me is prolonged and twisted, with tenacious storms blowing ferociously against me, but at least my adventure has finally begun. Of course, there have been key influencers along the way whom have also inspired me, but I only have you to thank for freeing up my mind in a way that no-one else possibly could, I will be forever grateful. I am so delighted and grateful that you gave me the once in a lifetime experience of assisting you with the creation of one of your enchanting conceptions. I was able to learn so much from that one day, and it will be a memory that I will be forever proud of. I am just sorry I could not have done more and that my tremendous curiosity, enthusiasm, passion and ambition got the better of me, it was only because I was truly re-awoken for the very first time in my life. Thank you Kirsty from the bottom of my heart, Wonderland has changed my life for the better in more ways than you could possibly imagine. I wish you all the very best success with whatever amazing things come your way; you more than entirely deserve it. Dear Adrian, thank you for such an incredibly thoughtful message, and I’m so sorry it has taken me so long to get around to replying to people, this week has just been exhausting and chaotic. It never ceases to amaze me how people connect to Wonderland and the depths of what they find within it and in turn themselves. It has been my own mountain and such a personal vision I never expected people to see beyond the surface, and for that I am incredibly grateful. Your words mean a great deal, and I hope you will find your path through you work and enjoy all the adventures and challenges that come with it. To know this project has inspired you and spurred you on in such a way is a very precious thing. Thank you. Kirsty, I have watched this project from the very beginning and I cannot even express to what degree you have moved and inspired me in my own healing journey through yours. I am somehow heartbroken that it comes to a close – but also I look forward to what is to come. I lost my own mother at a young age – and I used creativity to escape into my own alternate world back then. I have since lost my father as well, and just two years ago, my fiancé was killed tragically in a helicopter crash. I was only 3 months shy of my 30th birthday. I began my own photographic journey after his death – self portraits I have done weekly throughout this entire year. It is not nearly as ambitious as your project – but everything you wrote in your diary entry I can relate to. This project has become a new beginning for me (I was a graphic designer before he died) and has changed me in ways I never imagined already. I just want to thank you for sharing not only your images but your words. Your truth and heart. You are certainly a big influence on me and inspire me to push farther always. Oh and the robin – just beautiful! It seems my fiancé likes to send vultures (one of his favorite birds, as he loved to watch them ride the thermals). Often I will find them perched in trees or landing somewhere, and will follow them to that place only to find the location for my next shoot. Magic exists I think, in the souls of those we love who never leave us. All my love dear friend. I do so hope that one day we meet. 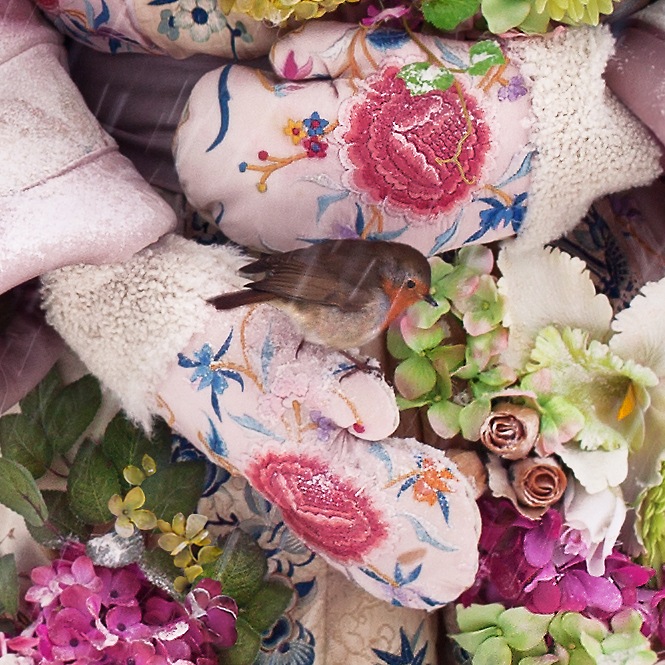 I am sorry to hear about your tragic loss Sarah, your work is stunning. Beautiful. Quite simply beautiful. I have treasured your photographs, your costumes, your magic ever since I first came across the lavender field shoot. What strikes me is the wonderful connection with your mother’s spirit and how you see her supporting you in all that you do. When my grandad passed away in August and we travelled for the funeral we saw a strange patch of rainbow colours in the sky which both my husband and I commented on as being odd. The next day at the funeral the vicar read out a poem that my grandma had written where in the final verse she likened him to a rainbow in the sky. Like you say: strange things happen and we find solace in that. I can’t wait for your book to be published and wish you every success with it. Kirsty, I’ve been following your wonderful images for some time, they are so out of this world that I can view them without the slightest sign of envy – I would never ever have come up with the very ideas in a million years. Thank you so much for putting yourself out there and sharing it with us. You know, suffering a loss and be broken is one thing. But it takes a special kind of person to take a devistating loss and turn it into a winning situation. Again, thank you for sharing your story with us. Kirsty! I’ve finally had the time to sit down and look at this last photograph properly…I can’t believe it’s the final one, it feels strange but also so right. Every journey needs and ending, and this one does not disappoint. I wondered if you were maybe going to end it with a dramatic shot or a close up portrait, I was not sure…but I believe this beautiful scene is perfectly fitting. I see it as very comforting, the thick blanket of snow, the curve of the hill, Katie’s cushioned coat, and that all important welcoming house…safe and sound after a long journey. Everything is still, and quiet, all the drama and noise is now muffled by the snowfall and it is time to take it all in, one last time, and let her be. The fresh, cleansed landscape is a new world, one that brings us closer to reality and to the end of this colourful walk. I like that she seems to present herself to us, keeps her distance and then turns her back. It is her moment, and you’ve respected that in the photograph. And what a big moment this must of been for you, I think I understand all the implications of this image, and what they represent for you on a personal note. It’s what I have always enjoyed about Wonderland, it does read like a diary in images, a mind process expressed by beautiful scenes. Letting her walk away must of been quite a challenge, to this home that represents so many things, so many contradictions. The snow works perfectly, it is symbolic in itself I think, it has a sense of cleansing, of renewal but also resonates with me as the end of something, like a new blank page, burying the past. 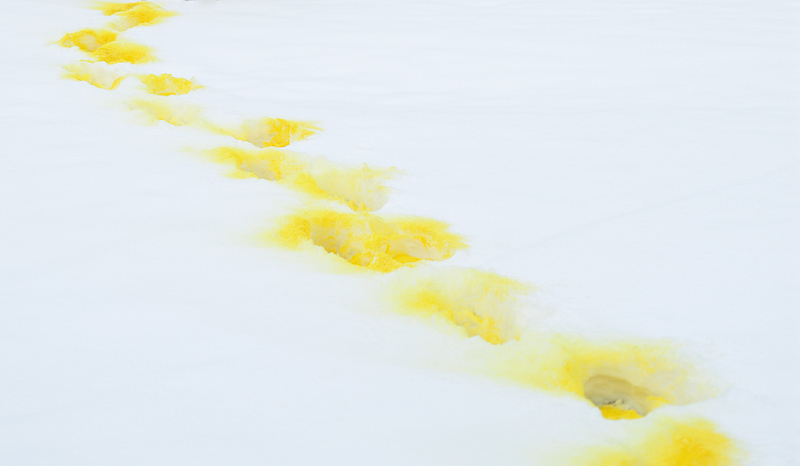 The drama and turmoil of emotions is now just a fading yellow imprint in the snow. It is the perfect curtain to draw on the theatre of Wonderland. When we lose someone, we tend to read the signs, acknowledge the light, welcome messengers and just be in a state of heightened awareness for any hooks and links that just keep us in enough contact with the ones we have lost to survive it. Their appearance in dreams and little moments of enchantment suffice to see us through the days. They are still there and live in our imaginations. This, I think, is what you have embraced and lies in the magic of Wonderland. Your deep connection with nature as a healing force has made so much magic happen, and since we all do it in some way or another, so many people have reacted to your work. These feelings are just hard to put into words sometimes, never mind photographs! This will not be last time I congratulate you, now that you have reached the end of this challenge, I know that I will be seeing many more beautiful images with your name on them. I congratulate you, this time, for all the hard work, courage and strength throughout this inspiring project, and for battling your demons with colour, love, nature and life. I love the confirmation that there is still magic in this world. I only ‘discovered’ your work in 2011 but I’ve joyfully followed you since then. Thank you for such a wonderful journey. You have made me remember that once upon a time, I used to belive in something greater than ourseleves. That beauty, that light, all those magic and unexplainable moments, are not other thing that pure love. In some way, you have healed me. Thank you. Never before has such beautiful photography evoked so many emotions, both towards your journey and those personal to me. I have cried, and felt your grief, I have smiled and felt your warmth. Your mum lives on through your heart.